I’ve recently joined the Urban Sketchers, an online group of people from around the world that like to draw (in whatever medium). Their ‘mission’ is to “Show the world, one drawing at a time”. 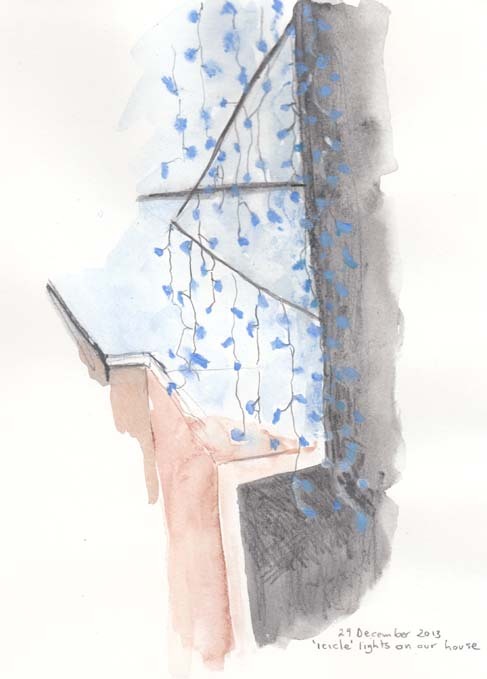 This week there is a theme to draw artificial light. Given it is Christmas there was only one choice for me – the ‘icicle’ lights on my house. Blue ‘icicle’ lights, 29 December 2013. There were several challenges to doing this drawing, not the least of which was re-setting the lights to ‘steady’, rather than a fit-inducing flashing sequence. The biggest problem was the colour of the light itself. Being such an intense blue (it gives a real disco fluorescent whiteness to any white clothing), it was a challenge to firstly see my page let alone get some realistic colour onto it. So, a la Vincent, I put on my camping headlight so I actually had a white light to work on my page. Capturing the intensity of the individual lights and the backwash of colour has proved quite difficult. However I’m happy with this first attempt. I will try to develop a more intense version of this scene, using photographs I’ve taken as I’m not sure that I could take another half hour session sitting in this light. After finishing I got one of those ‘afterglow’ optical effects where everything I saw went ‘orange’. The only other time I have had such a strong effect was in experiencing James Turrell’s work Open Field, at the Chichu Museum on Naoshima Island in Japan. 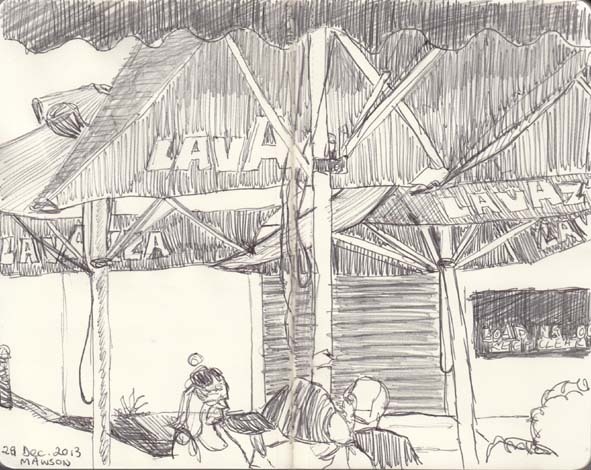 Yesterday I drew the view looking out from the cafe. I always love a good umbrella, or several, to draw! Looking out from the Italian bakery in Mawson, 28 December 2013. 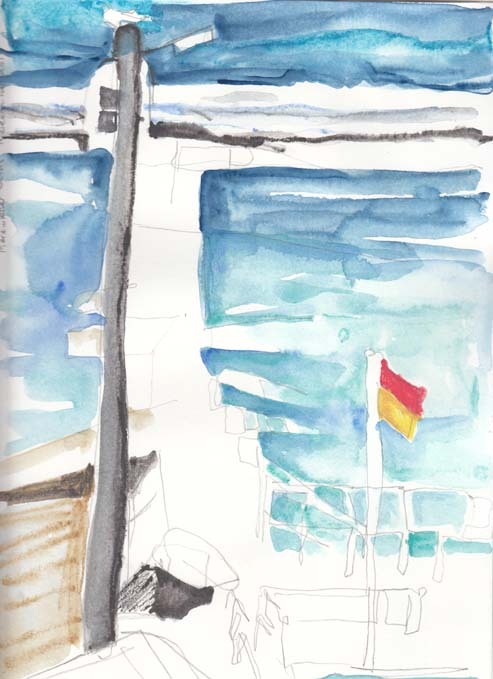 While I was in Newcastle last week I took the opportunity to take my sketchbook to Merewether ocean baths. Built between 1934-35 these ocean baths have two pools, one for children and a deeper pool as well, both of which are the size of several Olympic swimming pools placed side by side. Filled with fresh seawater they are a very popular place for Novocastrians to swim. To my dismay I realised I hadn’t packed my watercolours. I opted instead for pencil drawings. 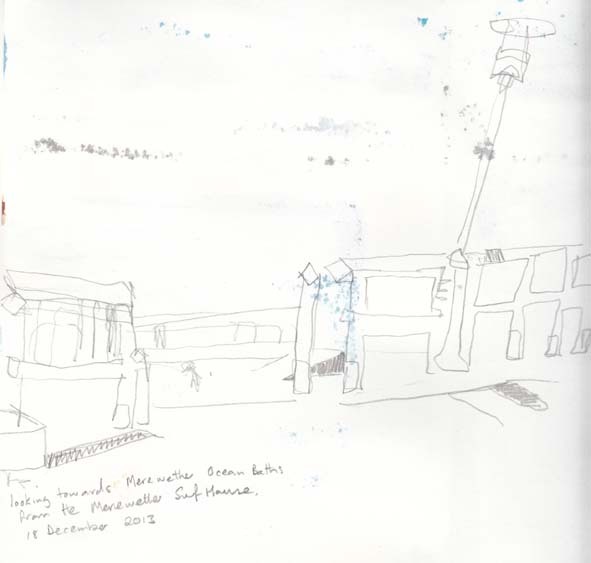 I did two drawings, one looking at one end of both pools and the second of the railings and path outside the nearby kiosk. 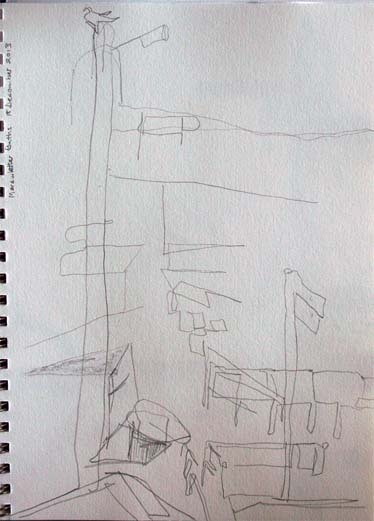 Blind drawing, Merewether ocean baths 18 December 2013. Apologies for the quality, but I decided to add the ‘missing’ colour later and only took a photo of the drawing before I added the paint. Here is the painted version. Merewether baths 18 December 2013 with watercolour added. I was not really happy with this outcome and to add insult to injury I realised too late that the very wet paint I used had seeped through to the drawing on the next page. Railings and pathway, Merewether Beach, 18 December 2013. No doubt I have a few lessons to take away from this experience! Stopped for a coffee this morning at the Italian bakery. 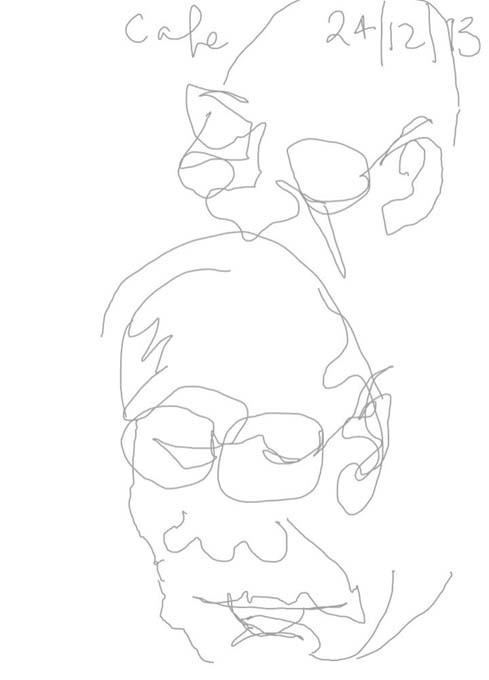 I’d left my small sketchbook at home so I used my ‘phablet’ for some very quick sketches of other patrons. Of course it’s not always easy to get drawing if the person is moving. 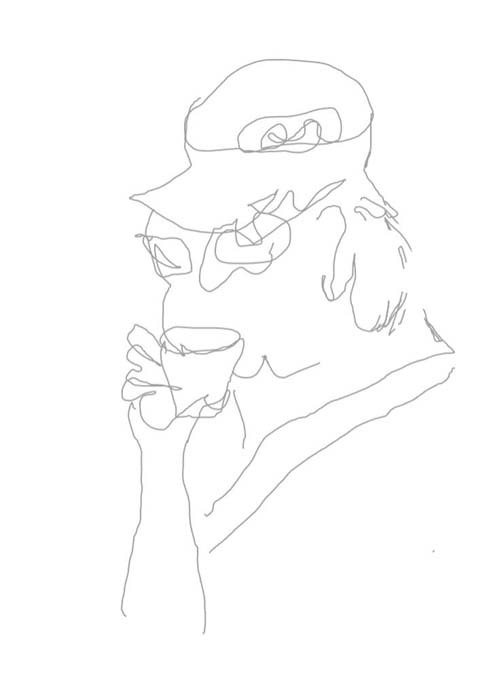 Coffee drinker, 24 December 2014. Every year I take photos of the sheep sculptures of Matthew Harding that were made for the Kambah Village Shopping Centre in 2002. I do this because every year, so far without fail, someone comes along and decorates the sheep for Christmas. OK they decorate them in the most random manner and with whatever decorations they can find, but decorate them they do. Today I drew the sheep for the first time. OK just two of them, there are more. 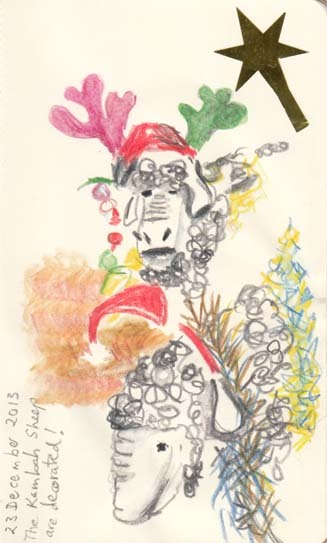 Kambah Village Sheep decorated for Christmas 23 December, 2013. Water colour pencil with found tinsel. I think it is the perfect summer juxteposition. Having my first swim of the season at Nobbys Beach in the centre of the city of Newcastle and within half an hour being in the Newcastle Art Gallery seeing the Brett Whiteley exhibition, Whiteley on Water. 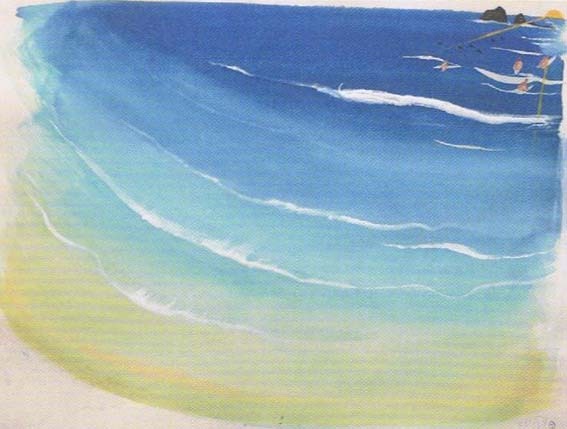 Brett Whiteley, Wategoes Beach II, 1989, watercolour, gouache, collage on white wove paper. Brett Whiteley Studio. Whiteley was a tremendously talented artist with very fluid painting and drawing skills. This show includes some powerful ink paintings of waves, vigorous sculptures from his early career and some quietly beautiful paintings. 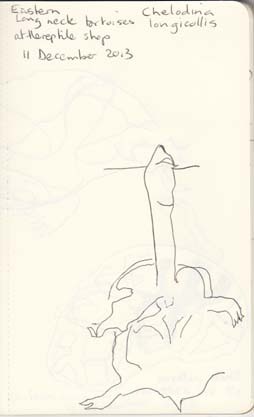 I decided to draw one of his pair of Shark sculptures, ‘Shark (Male)’ of 1966, which stood in front of his ‘Unfinished Beach polytypch’, undated. 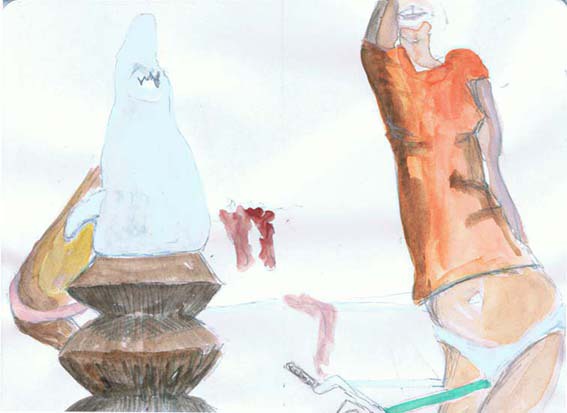 Both works are owned by the Brett Whiteley Studio. 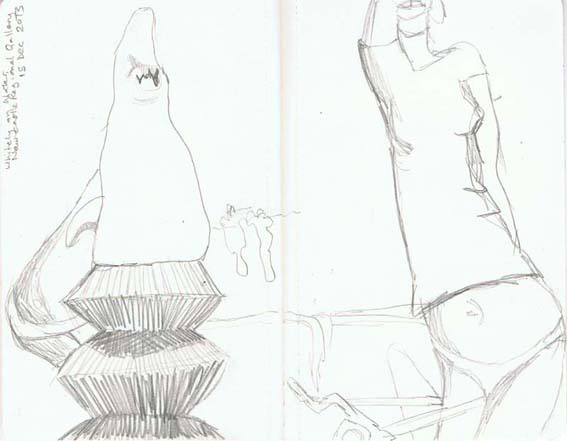 Drawing of Brett Whiteley’s Shark (male), 1966, in front of Unfinished beach poltypch, not dated. 15 december 2013. I also scanned and then coloured a version of this drawing. The reptile shop next to our regular cafe has placed a large tank containing Eastern Longnecked Turtles (Chelodina longicollis) where they can be observed from outside the shop. These turtles are quite common in the waterways of eastern Australia and are one of the few native animals often kept as pets. We sat next to this window today so I spent quite a bit of time enjoying watching the turtles paddle languidly around their tank. These turtles shells are about the size of a bread and butter plate – although they do get up to dinner plate size as they get older. An Eastern Longnecked Turtle floats by. 11 December 2013. It was easy to observe the undersides of these animals with their ochre and black patterned shell. 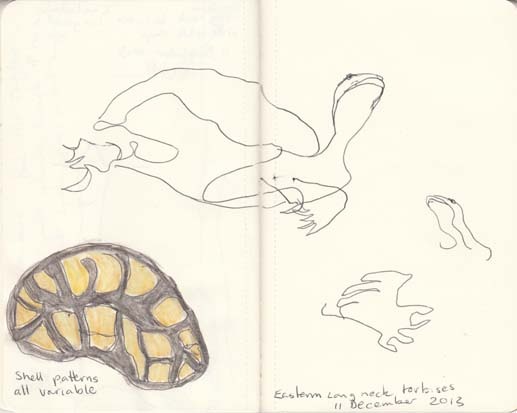 Unlike my drawing, the turtles shells are fairly oval in shape. It appeared that each animal had a different pattern on the underside of its shell. When the turtles surface for air they ‘hang’ in the water with just their nostrils above the water’s surface. No doubt a sensible strategy to reduce the possibility of being grabbed by a bird of prey. One of the smaller turtles taking in a few breaths of air, 11 December 2013.